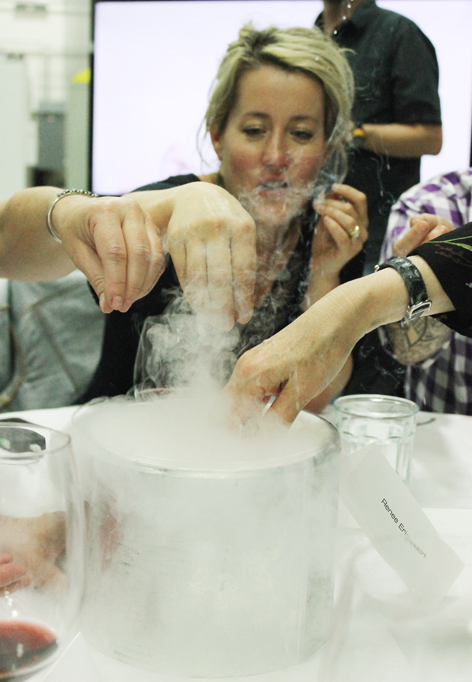 What would a Modernist Cuisine dinner be without a little liquid nitrogen action going on? Chef Naomi Pomeroy gets in on the fun. 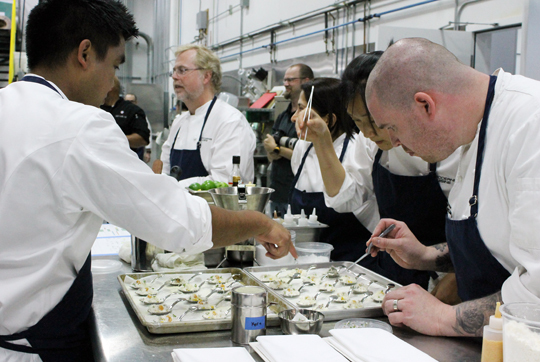 BELLVUE, WA — Nathan Myhrvold, former Microsoft chief technology officer turned maestro of modernist cuisine, has held less than a dozen invitation-only dinners at his Intellectual Ventures laboratory. 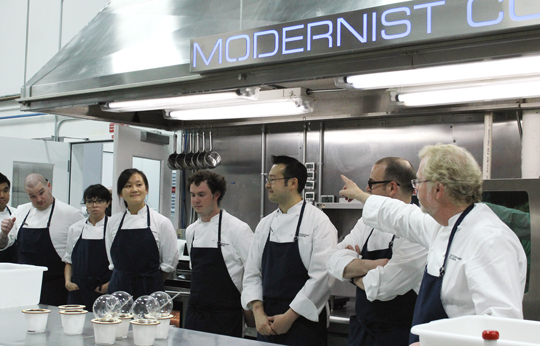 The exclusive guests have included the likes of Thomas Keller, Ferran Adria, David Chang and Jose Andres. In June, I was lucky enough to join that illustrious list when I was invited to be part of a very special dinner. What made this dinner so epic was not only the fact that it was Myhrvold’s largest dinner party to date, but that all the guests were women. 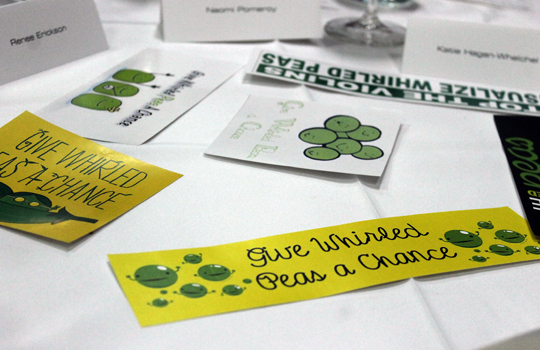 The wizard-genius behind it all, Nathan Myhrvold, stops by each table to explain the dishes. 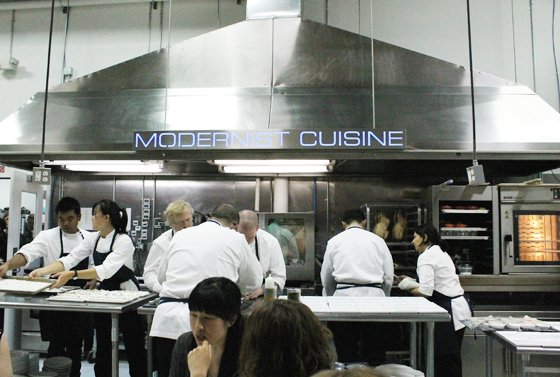 The Modernist Cuisine team hard at work on the one-of-a-kind dinner. 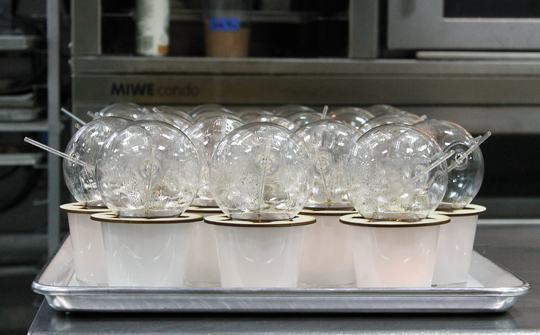 A reminder that you are dining in an actual science laboratory. 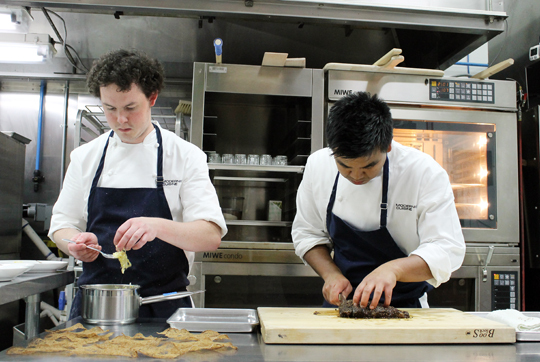 Three big round tables were set up in the lab, where everyone could watch the cooking going on. Course #2: Elote — a take on Mexican street corn with freeze-dried corn, crema powder and chile aioli. Course #5: Tofu — only made with soy milk and heavy cream. Sesame seeds and Asian pear dot the top. 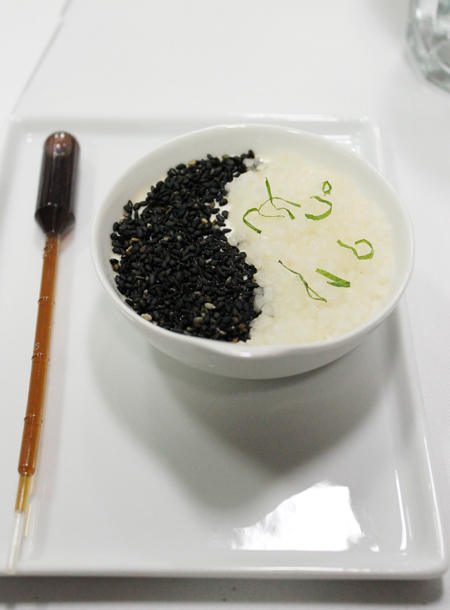 A syringe of ponzu sauce is alongside. 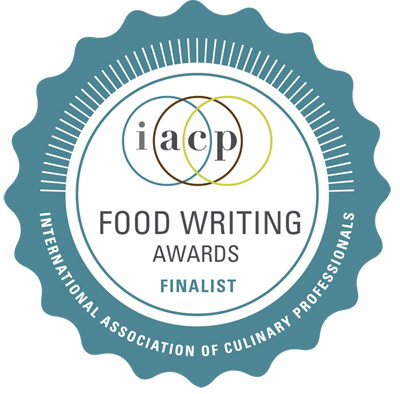 Now that my story on the dinner published in Food Arts this month, my editor finally gave me the approval to blog about it. Believe me, it was torture not to be able to do so sooner. 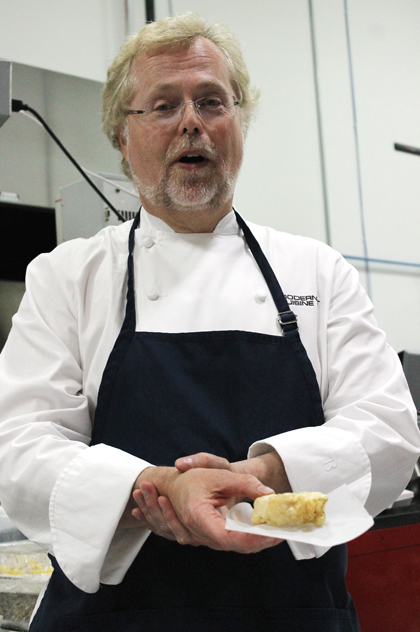 Read my story in the September issue of the magazine to find out more about what prompted Myhrvold to host such a dinner, plus the reaction to it by the women attendees. 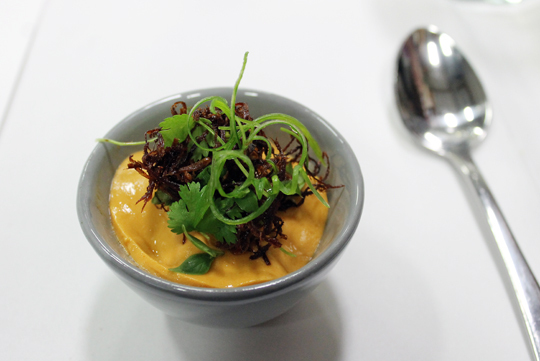 Course #6: Squid — squid jerky on top and uni underneath. An intense dish. To get a look at more of the astounding food — loaded with humor, irony and thrills — continue scrolling down. 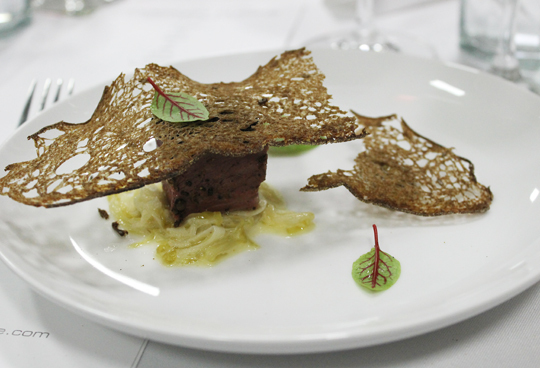 Course #7: Binchotan. 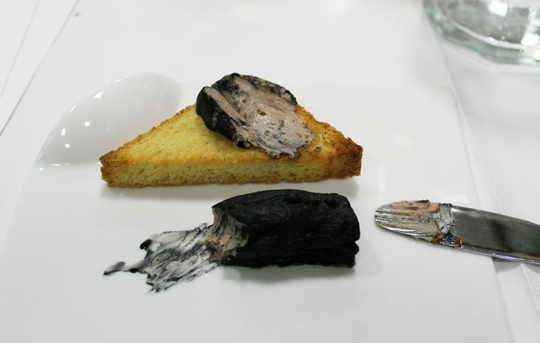 A play on Japanese charcoal used for grilling. 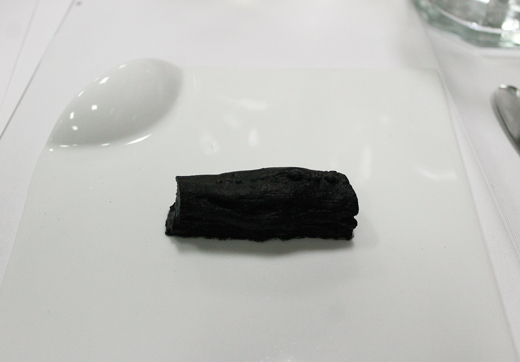 It looks like a stick of charcoal…. 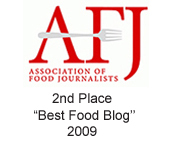 It turns out to be foie gras. Course #8: Steak Frites. 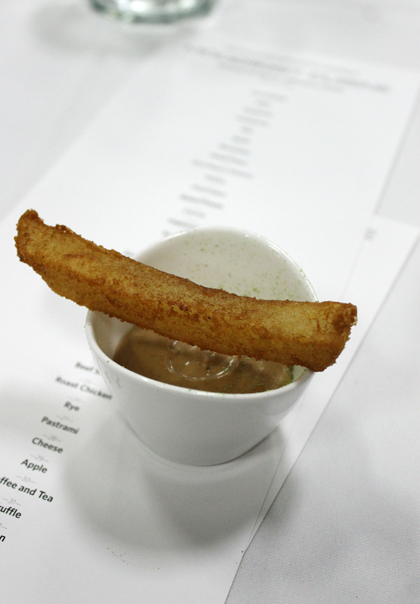 A tiny cup of intense beef mousseline with one perfect French fry balanced on top, its ultracrisp exterior the result of the potato being placed in the same type of ultrasonic bath used to clean jewelry to create bubbles on the tuber’s surface before frying. To get us in the mood for this course. 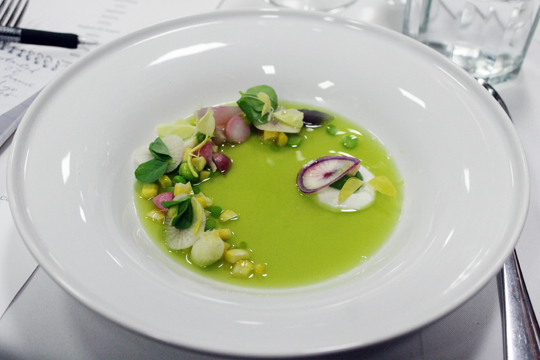 Course #9: Give Peas a Chance. 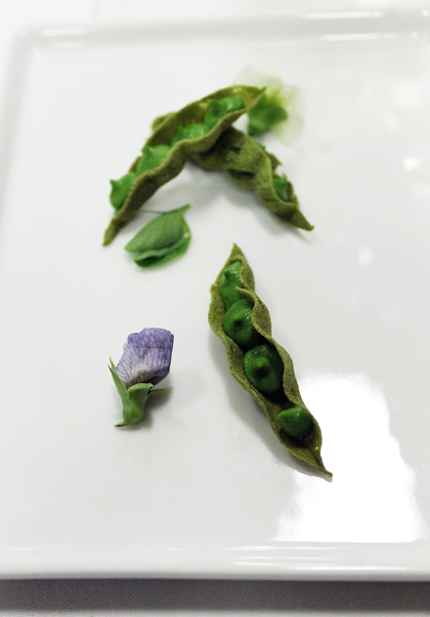 What looks like peas in a pod is actually a silky pea puree made by spinning frozen Green Giant peas in a centrifuge. 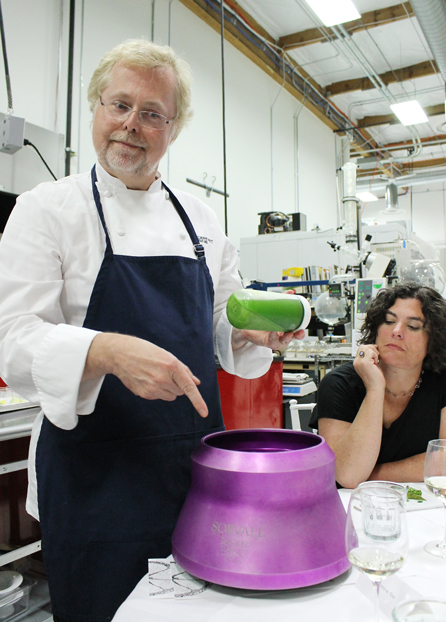 Myhrvold delights in telling everyone how the pea dish was created. 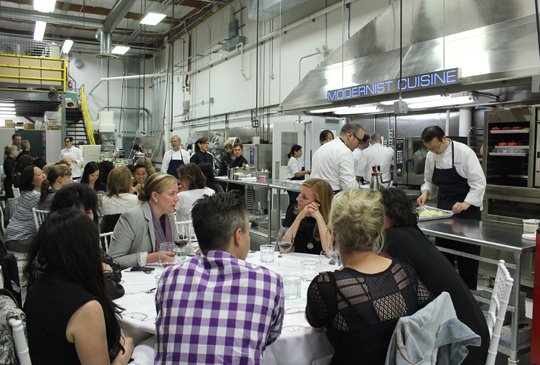 Chef Renee Erickson looks on with disbelief. 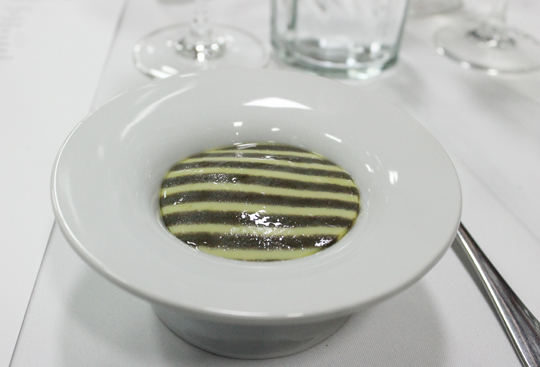 Course #10: Pistou. The pea liquid left over from spinning the peas in the centrifuge is made into a broth that tastes of sweet, sweet peas. Course #17: Spaghetti Vongole. Or is it? The “noodles” are actually geoduck. It’s flavored with walnut marmalade and miso powder. One of my favorite dishes of the night. 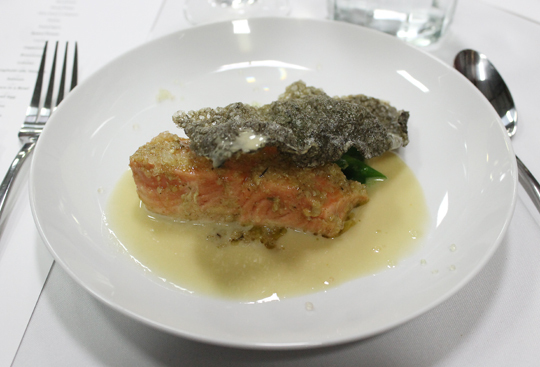 Course #18: Salmon. The flesh is as lusciously soft as custard. The skin is made into a chicharron. 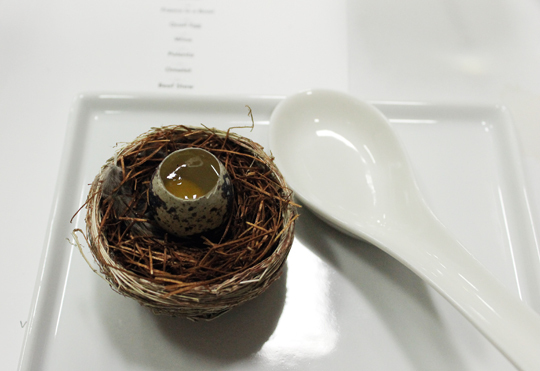 Course #20: Quail Egg. Not really. It’s actually a mock raw egg made out of passion fruit. Course #23: Omelet. It’s made with two batters, one with powdered mushroom. Course #24: Beef Stew. Myhrvold wanted to make a rare beef consomme. The brilliant magenta color was set with the help of carbon monoxide. Showing off the gorgeous roast chicken. Course #25: Roast Chicken. The skin is shatteringly crisp and paper thin. 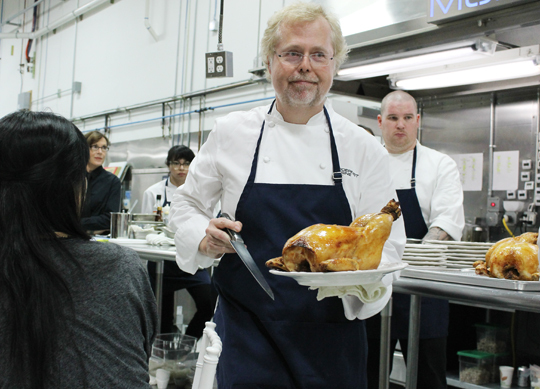 The chicken is brined by injecting the flesh so it never touches the skin. The chicken is hung for three days upside-down before roasting. Course #27: Pastrami. Seriously, the best and most tender pastrami — ever. The beef is brined for four days, then smoked for six hours. 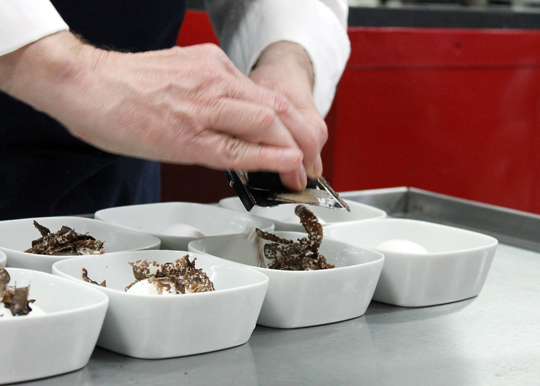 Shaving what looks like black truffle. 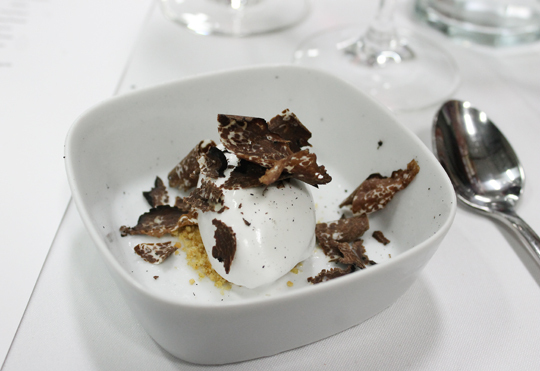 Course #31: Truffle. It turns out to be chocolate made to look like a truffle, complete with striations. It’s served with coconut ice cream and almond nougatine. 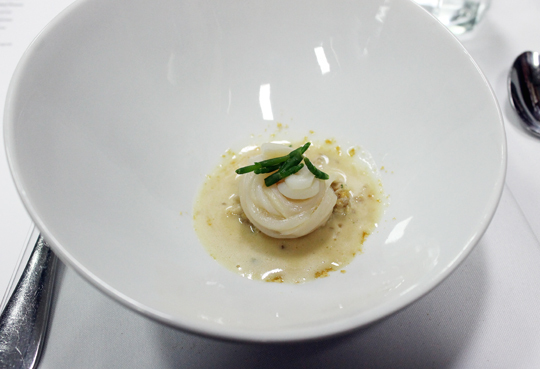 Course #32: Onion. They look like little ice cream cones. 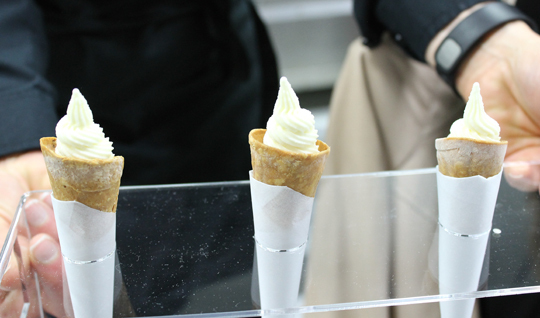 But what’s inside is actually an onion soft-serve. 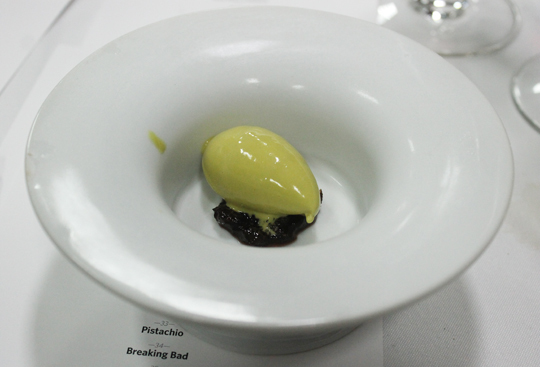 Course #33: Pistachio. The famed pistachio ice cream. Only it contains no dairy whatsoever. It’s made with nuts, sugar, and hydrocolloids. The taste is bold. The texture beyond smooth. Course #34: Breaking Bad. 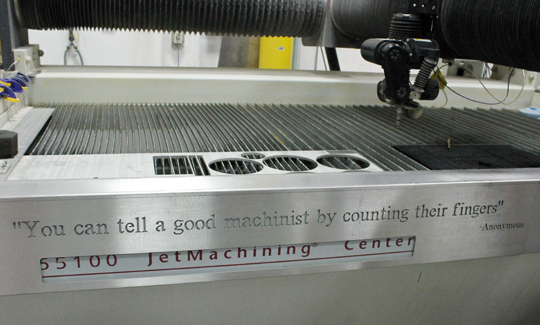 It’s the course everyone is most curious about. One chef joked that Myhrvold surely must be making crystal meth for the crowd — because if anyone can make it easily, it would be him. It’s actually bourbon and vanilla that’s heated. 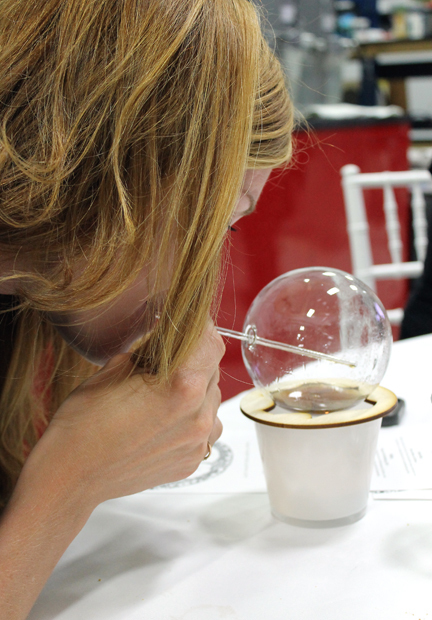 A cocktail — if you will — that you inhale, but don’t sip. You get all the flavor with no calories consumed. Pastry Chef Christina Tosi demonstrates. The team gets a round of applause at the end of the epic meal. Wow! What a terrific time that must have been! I really envy you — such an opportunity. Great post, fun pictures — thanks. It must have been VERY difficult to keep this a secret for all this time. How fabulous! 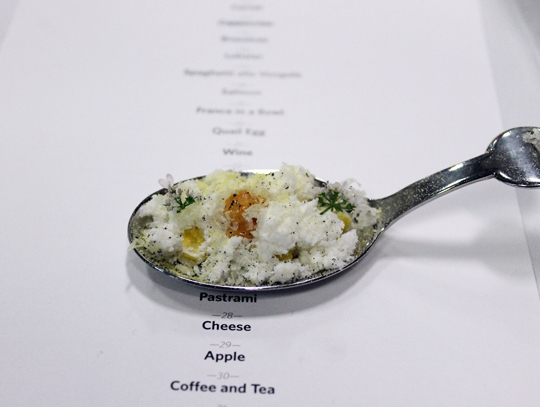 I love course # 10 Pistou – talk about emulating the French by not wasting anything! OMG. You are soooo lucky!!! And I am sooooo jealous! 😉 What a once-in-a-lifetime meal. Everything looks so interesting and unique. Such a smart looking presentation. Just wow. I am in awe. You certainly earned the “Highest Level of Discretion” award for that enforced silent period, Carolyn. From the look of those pictures, you were being served edible art. And thanks to your images, we get to share the feast with our eyes. 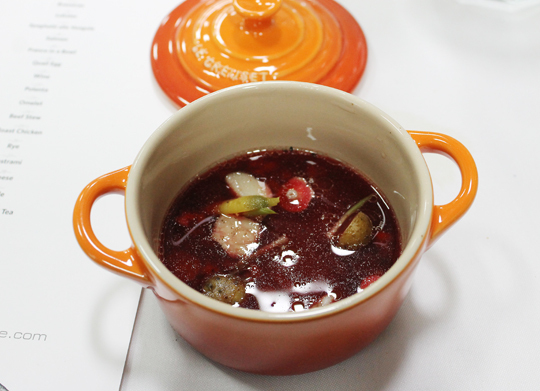 That Pistou looks like Spring in a bowl. Really gorgeous. 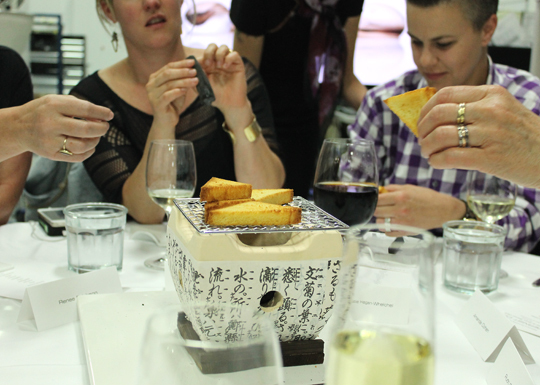 Tami: I always feel like El Bulli is the “one that got away.” Would have loved to have gone there to dine. Let’s hope Ferran opens up another place in the future. If not, we can always try his brother’s restaurants in Spain. The next best thing. And here I am all smug thinking about my upcoming reservation at Le Bernadin. Carolyn, you roll in elite circles! jstew52: You will love Le Bernardin. 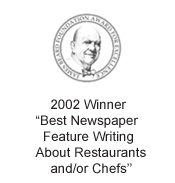 I had the chance to dine there a couple years ago when Chef Eric Ripert was in the house, too. A truly incredible meal. Enjoy your time there! WOW! What an incredibly unique and fascinating experience! Definitely a meal to remember. Wow! Rubbing elbows with some big names huh? Must be nice. Brent: It truly was a memorable time. I told Nathan that it was right up there with meeting Julia Child, which made him smile.